The light at the end of the tunnel! I’m approaching the last few rounds of editing on Book 2 of the Idyll Trilogy! One of my biggest challenges in writing THE WILDS is that its plot is split into two separate-but-parallel tracks for most of the novel. I have two sets of characters working toward their own independent goals, but with tangential plots and bits of mysteries threading in between them. My hope is that the reader will find out things in one plot-thread and realize it has big ramifications for characters in the second plot-thread, and vice-versa. But intertwining those two stories (and flows of information) has become quite complicated. How to keep all of this straight? Storyboarding! 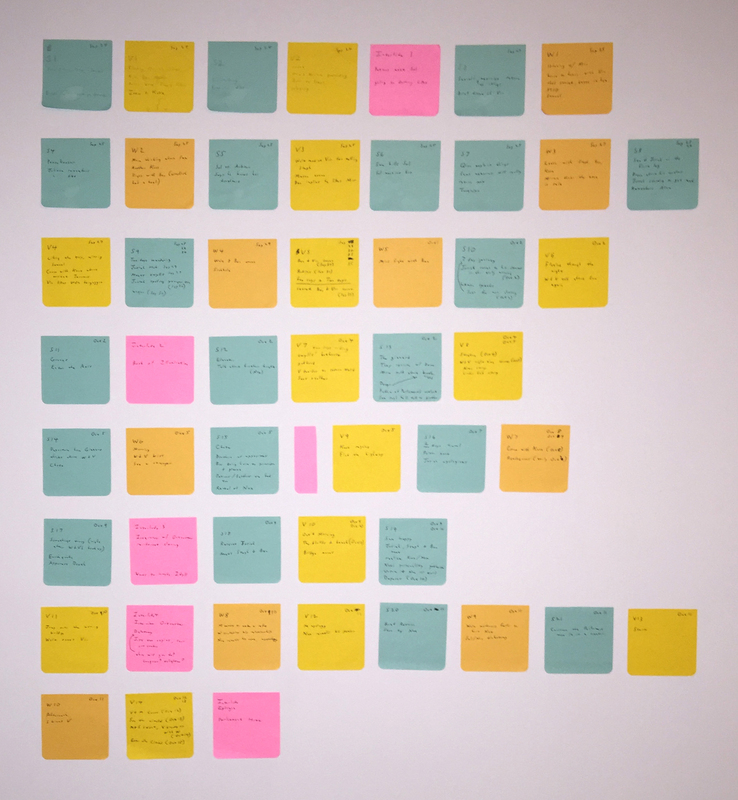 If you look at the pictures in this post, each colored sticky note sums up a chapter in the WILDS. They’re color-coded to represent different P.OV.s. This book has three main narrators. To avoid spoilers, I won’t pass on any other details. 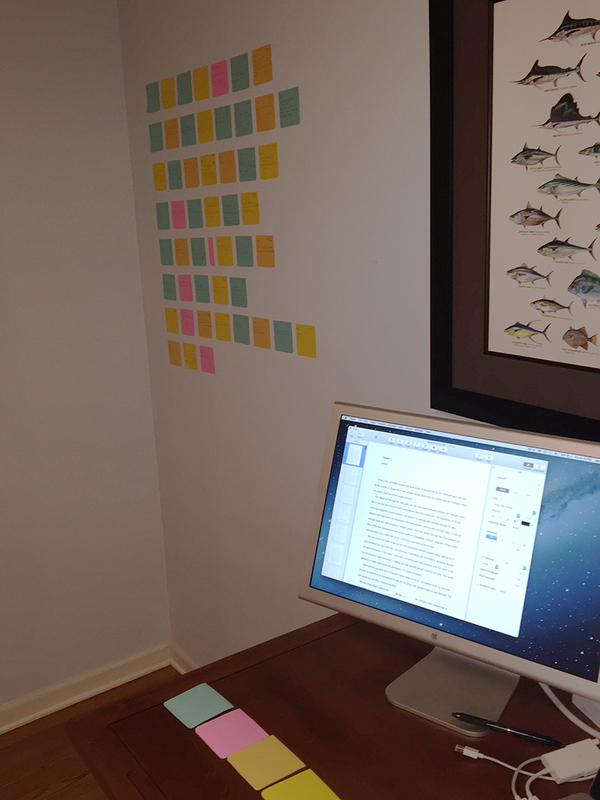 At least two times, I rearranged sticky notes because I realized the story beats had a bigger impact when they flowed in a different way. (For instance, while one set of characters is in dire trouble; the other set of characters are blissfully unaware and having a happy/relaxing day). Also, storyboarding was a great way to visualize the novel’s timeline. THE WILDS takes place over a span of about three weeks, so it’s incredible useful to have a way to keep track of the characters’ days. Another thing that I now see: I’m using LOTS of pages to describe plot points that can be broken down on a few dozen sticky notes. Looks like I need another round of trimming the fat! So if you’re trying to manage multiple plot threads and points-of-view, maybe give storyboarding a try!